A team of researchers that includes two members of the Department of Geography in Virginia Tech's College of Natural Resources and Environment is working to better understand how riverbank erosion affects the citizens of Bangladesh and to develop early-warning measures that may help mitigate the effects of the changing shoreline. The Ganges-Brahmaputra-Meghna river basin, which runs from the Himalayas through Bangladesh, is the third largest river basin in the world. While only 7 percent of the river basin's area is located in Bangladesh, over 90 percent of the basin's discharge flows through the country. "The average erosion rate is 100 meters per year in many locations near the coast, so it's a huge shock, both economically and socially, especially for people who are already challenged economically," said Tom Crawford, professor and chair of the Department of Geography. "We want to understand how coastal erosion is linked to precipitation patterns and how humans are continuing to secure their livelihoods in the face of erosion." Crawford and postdoctoral associate Munshi Khaledur Rahman, also from Virginia Tech's Department of Geography, are working with researchers from East Carolina University, Kansas State University, and Bangabandhu Sheikh Mujibur Rahman Agricultural University in Bangladesh to conduct a three-year study on coastal erosion, human vulnerability, and adaptation strategies to promote resilience in the face of erosion disturbances. The team, whose work is funded by a grant from the National Science Foundation's Geography and Spatial Sciences Program, hopes to develop a better understanding of how shorelines are changing in their study area over time and how those changes affect the people who live nearby. "Ultimately, we'd like to be able to provide new scientific insights and give back to Bangladesh and the affected communities by developing a predictive early-warning model that will help alert villagers if rainfall and erosion are going to be particularly bad in a given year," Crawford added. The first phase of the study, which began in September 2017, included a January 2018 field visit to two villages in Bangladesh that will serve as study sites. The team met with local villagers, government officials, and nonprofit workers to introduce the project. "We received so much support from the local people," Rahman said. "Everyone was very willing to help, and we were able to meet with one of the parliament members from the area. It helped to have his approval." In addition to meeting with the villagers and local leaders, the team also spent time in Dhaka, the capital city of Bangladesh. There, they met with government officials to discuss the project and participated in a scientific conference on environmental hazards in Bangladesh. Crawford also gave a guest presentation for Dhaka University's Geography Department. "It was a great experience to connect with the university's geography department. Two of our team members completed their undergraduate geography degrees there, so it was like coming home for them," Crawford said. In March and April, faculty team members and students from Bangabandhu Sheikh Mujibur Rahman Agricultural University will implement surveys to 400 households and hold focus groups in the two villages. In May, Rahman will return to Bangladesh to conduct key informant interviews and bring back data for quantitative and qualitative analysis. "We want to know how people who are affected by riverbank erosion adapt when they lose their land," Crawford said. "Do they move in with nearby family? Do they migrate to a neighboring village or to a city like Dhaka?" Crawford and Rahman will also use satellite images captured between 1988 and 2018 to plot spatiotemporal patterns of erosion and generate location-specific annual rates of erosion and erosion variability. Scott Curtis, professor of atmospheric science at East Carolina University, will compile precipitation data for that time period, which will help the team determine how precipitation impacts shoreline changes. Ultimately, the researchers hope to develop a predictive model, much like the system used for predicting the severity of hurricane seasons in the United States, that will help the people of Bangladesh better prepare for major erosion events. "We're trying to bring science into the real world and solve real-life problems," Rahman said. 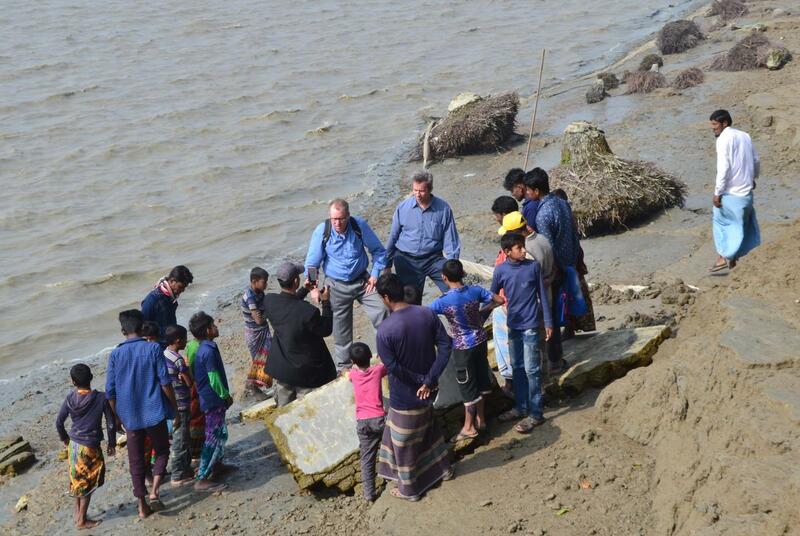 "We hope that the findings of this study will benefit the communities in Bangladesh that are suffering due to riverbank erosion and address global environmental issues through scientific contributions to the discipline."